For the ball game, see four square. For the company, see Foursquare (company). For other uses, see Four square (disambiguation). The service was created in late 2008 by Dennis Crowley and Naveen Selvadurai and launched in 2009. Crowley had previously founded the similar project Dodgeball as his graduate thesis project in the Interactive Telecommunications Program (ITP) at New York University. Google bought Dodgeball in 2005 and shut it down in 2009, replacing it with Google Latitude. Dodgeball user interactions were based on SMS technology, rather than an application. Foursquare was the second iteration of that same idea, that people can use mobile devices to interact with their environment. Foursquare was Dodgeball reimagined to take advantage of new smartphones like the iPhone, which had built-in GPS to better detect a user's location. Until late July 2014, Foursquare featured a social networking layer that enabled a user to share their location with friends, via the "check in" - a user would manually tell the application when they were at a particular location using a mobile website, text messaging, or a device-specific application by selecting from a list of venues the application locates nearby. In May 2014, the company launched Swarm, a companion app to Foursquare City Guide, that reimagined the social networking and location sharing aspects of the service as a separate application. On August 7, 2014, the company launched Foursquare 8.0, the completely new version of the service which finally removed the check-in and location sharing entirely to focus on local search. As of 2016, Foursquare had 50 million monthly active users. As of 2011, male and female users are equally represented and also 50 percent of users are outside the US. Foursquare lets users search for restaurants, nightlife spots, shops and other places of interest in their surrounding area. It is also possible to search other areas by entering the name of a remote location. The app displays personalized recommendations based on the time of day, displaying breakfast places in the morning, dinner places in the evening etc. Recommendations are personalized based on factors that include a user's check-in history, their "Tastes" and their venue ratings. Foursquare eschews the traditional concept of letting users leave long-form reviews, and instead encourages the writing of "Tips" - short messages about a location that let other users know what is good (or bad) there. Tips are limited to 200 characters in length, but can include a URL to link to an external site with more information, and can include a photo. As a reward for leaving quality tips, a user can earn "expertise" in a particular location (e.g. a neighborhood or city) or category (e.g. Italian restaurants). Foursquare has a defined list of "tastes" in particular food items, styles of cuisine or environmental aspects, which users may add to their profiles to let the app know what they like. The app uses natural language processing to match a user's tastes with the tips at nearby venues that mention them. Foursquare uses its own proprietary technology, Pilgrim, to detect a user's location. When users opt in to always-on location sharing, Pilgrim is able to understand a user's current location by comparing historical check-in data with the user‘s current GPS signal, cell tower triangulation, cellular signal strength and surrounding wifi signals. The app uses the location service to track a user's location in the background, enabling push notifications of things the user might find interesting in their vicinity. It uses this ability to learn about the kinds of places a user likes, based on when and how often they visit different venues. It then uses this data to improve a user's recommendations and gauge the popularity of a venue. In addition to leaving Tips, Foursquare lets users rate venues by answering questions. The questions help Foursquare understand how people feel about a place, including whether or not a user likes the place, how trendy it is, its cleanliness, and its noise level. It also uses these questions to fill in missing venue information such as asking whether the venue takes credit cards, or whether it has outdoor seating. Foursquare gives each venue a numeric score between 0.1 and 10 to indicate its general popularity when compared to other venues. Scores are calculated automatically factoring in check-in data, explicit user ratings, tip sentiment, foot traffic behavior and other signals. Users can add venues to a personal "to do" list and curated lists to track neighborhood hot-spots or things to do while traveling. The service provides ten levels of Superuser. Superuser status is awarded to users after they apply and perform a special test where users should meet quality and quantity criteria. Only Superusers have the ability to edit venue information. Superusers can attain different levels as they contribute more high-quality edits over time. In the past, Foursquare has allowed companies to create pages of tips and users to "follow" the company and receive tips from them when they check-in at certain locations. On July 25, 2012, Foursquare revealed Promoted Updates, an app update expected to create a new revenue generation stream for the company. The new program allowed companies to issue messages to Foursquare users about deals or available products. Earlier versions of Foursquare supported check-ins and location sharing, but as of Foursquare 8.0, these were moved to the service's sibling app, Foursquare Swarm. Foursquare 8.0 never shares a user's location with their followers. In previous versions of Foursquare, if a user had checked into a venue on more days than anyone else in the past 60 days, then they would be crowned "Mayor" of that venue. Someone else could then earn the title by checking in more times than the previous mayor. Businesses could also incentivize mayorships through rewards for users who were the mayor (such as food and drink discounts). As the service grew, it became increasingly difficult to compete for mayorships in high-density areas where the service was popular. The mayorship feature was retired from version 8.0 and reimplemented in Swarm. Badges were earned by checking into venues. Some badges were tied to venue "tags" and the badge earned depended on the tags applied to the venue. Other badges were specific to a city, venue, event, or date. In September 2010, badges began to be awarded for completing tasks as well as checking in. In version 8.0, badges were retired, which upset some existing users. Earlier versions of the app also used a "points" system with users receiving a numerical score for each check-in, with over 100 bonuses to gain additional points, such as being first among friends to check into a place or becoming the venue's mayor. In version 8.0 points and leaderboards were retired, but were reimplemented in the Swarm app. "Specials" were another feature of the app that acted as an incentive for Foursquare users to check in at new spots or revisit their favorite hangouts. Over 750,000 businesses offered "Specials" that included discounts and freebies. They were intended for businesses to persuade new and regular customers to visit their venues. "Specials" included anything from a free beer for the first check-in to 10% off at a restaurant. In May 2014, the company launched Swarm, a companion app to Foursquare, that migrated the social networking and location sharing aspects of the service into a separate application. Swarm acts as a lifelogging tool for the user to keep a record of the places they have been, featuring statistics on the places they have been, and a search capability to recall places they have visited. Swarm also lets the user share where they have been with their friends, and see where their friends have been. Check-ins are rewarded with points, in the form of virtual coins, and friends can challenge each other in a weekly leaderboard. Checking in to different categories of venue also unlocks virtual stickers. Though it is not necessary to use both apps, Swarm works together with Foursquare to improve a user's recommendations - a user's Swarm check-ins help Foursquare understand the kinds of places they like to go. Foursquare City Guide is available for Android, iOS & Windows Phone devices. Versions of Foursquare were previously available for Symbian, Series 40, MeeGo, WebOS, Maemo, Windows Phone, Bada, BlackBerry, PlayStation Vita, and Windows 8. Users may also use their mobile browsers to access Foursquare mobile, but feature phone users must search for venues manually instead of using GPS that most smartphone applications can use. Foursquare started out in 2009 in 100 worldwide metro areas. In January 2010, Foursquare changed their location model to allow check-ins from any location worldwide. In September 2010 Foursquare announced version 2.0 of its check-in app which would help to direct users to new locations and activities, rather than just sharing their location with friends. The list of personal list of places and activities, called to-dos, was separated from the general advice from other users section called "tips". Foursquare has also created a button that would add any location in the app to a user's to-do list, and the app would now remind the user when there were to-do items nearby. Around this time, third party sites such as The New York Times, Wall Street Journal, and Zagat added an "Add to My foursquare" button, which would add a location to the user's to-do list. On February 21, 2011, Foursquare reached 7 million users IDs. The company was expected to pass 750 million check-ins before the end of June 2011, with an average of about 3 million check-ins per day. On August 8, 2011, President Barack Obama joined Foursquare, with the intention that the staff at the White House would use the service to post tips from places the president has visited. On June 7, 2012, Foursquare launched a major redesign, which they described as a "whole new app". The app's "explore" function now allowed users to browse locations by category or conduct specific searches like "free wi-fi" or "dumplings". Foursquare incorporated features from social discovery, and local search applications as well as the "like" feature made famous by Facebook. In May 2014, Foursquare launched Swarm, a companion app to Foursquare City Guide, which moved the social networking and location sharing aspects of the service to a separate application. On August 7, 2014, the company launched Foursquare 8.0, the completely new version of the service which finally removed the check in and location sharing entirely, to focus entirely on local search. Foursquare acknowledged a grass-roots effort that started in Tampa, Florida, in 2010 by declaring April 16 "Foursquare Day", April being the 4th month and the 16th being equal to four squared. Foursquare Day was coined by Nate Bonilla-Warford, an optometrist from Tampa, Florida, on March 12, 2010. The idea came to him while "thinking about new ways to promote his business". In 2010, McDonald's launched a spring pilot program that took advantage of Foursquare Day. Foursquare users who checked into McDonald's restaurants on Foursquare Day were given the chance to win gift cards in $5 and $10 increments. Mashable reported that there was a "33% increase in foot traffic" to McDonald's venues, as apparent in the increase in Foursquare check-ins. In February 2010, a site known as Please Rob Me was launched, a site which scraped data from public Twitter messages that had been pushed through Foursquare, to list people who were not at home. The purpose of the site was to raise awareness about the potential thoughtlessness of location sharing, the site's founder saying "On one end we're leaving lights on when we're going on a holiday, and on the other we're telling everybody on the internet we're not home." A privacy issue was also observed for those who connected their Twitter account to Foursquare. If such a user was joined at a location by one of their Foursquare contacts who was also using Twitter, that user would have the option to have Foursquare post a message such as "I am at Starbucks – Santa Clara (link to map) w/@mediaphyter" to their own Twitter feed. Similarly, if a user had agreed for their location to be shared with other Foursquare users, that user's Foursquare contacts would be able to easily share their location publicly on Twitter. Later in 2010, white hat hacker Jesper Andersen discovered a vulnerability on Foursquare that raised privacy concerns. foursquare's location pages display a grid of 50 pictures that is generated randomly, regardless of their privacy settings. Whenever a user "checks-in" at that location, their picture is generated on that location page, even if they only want their friends to know where they are. Andersen then crafted a script that collected check-in information. It is estimated that Andersen collected around 875,000 check-ins. Andersen contacted Foursquare about the vulnerability, and Foursquare responded by fixing their privacy settings. 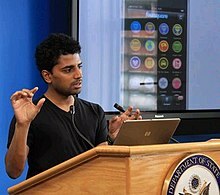 In 2011, in response to privacy issues regarding social networking sites, Foursquare co-founder Naveen Selvadurai stated that "Users decide if they want to push to Twitter or Facebook, over what information they want to share and send" and "There is a lot of misunderstanding about location-based services. On Foursquare, if you don't want people to know you are on a date or with a friend at a certain place, then you don't have to let people know. You don't check in." Selvadurai also stated that Foursquare does not passively track users, which means a user has to actively check in to let people know where they are. On May 8, 2012, Foursquare developers announced a change to its API  in response to a number of so-called "stalker" applications which had been making the locations of, for example, all female users within a specific area available to the public. Jiepang – a similar service often dubbed the "Foursquare of China"
^ Cohen, David (2 October 2018). "Foursquare Closes $33 Million Funding Round, Aiming to 'Refine' Its Products". Adweek. Retrieved 14 December 2018. ^ "Foursquare.com Site Info". Alexa Internet. Retrieved 2018-12-05. ^ a b Crook, Jordan (19 January 2018). "Foursquare is finally proving its (dollar) value". TechCrunch. Retrieved 18 December 2018. ^ Kim, Sam (2015-04-24). "How Foursquare and Other Apps Guess What You Want to Eat". Eater. Retrieved 2017-01-18. ^ "About". Foursquare.com. Retrieved 2014-08-25. ^ Gillmor, Steve (2011). "dodgeball.com officially Google'd". techcrunch.com. Retrieved 16 March 2011. ^ Kincaid, Jason (March 18, 2009). "SXSW: Foursquare Scores Despite Its Flaws". The Washington Post. ISSN 0190-8286. Retrieved March 16, 2011. ^ "Foursquare Now Officially At 10 Million Users". TechCrunch. 2011-06-20. Retrieved 2014-08-25. ^ Heath, Alex (1 January 2016). "Foursquare has an amazing 'superpower' that wants to take over your phone". Business Insider. Retrieved 18 December 2018. ^ "Foursquare Superusers". 2017-02-01. Retrieved 2017-05-23. ^ Olanoff, Drew (6 May 2012). "If you're a foursquare "superuser", then you need hopscotch for iOS". The Next Web. Retrieved 5 August 2018. ^ Protalinski, Emil (3 January 2014). "Foursquare details how it rewards and punishes the superusers who maintain its database of 60 million venues". The Next Web. Retrieved 5 August 2018. ^ "Foursquare Developer". developer.foursquare.com. Retrieved 2019-04-08. ^ "Episode 210: Hannover Messe and haptic IoT – IoT Podcast – Internet of Things". Retrieved 2019-04-08. ^ Lowensohn, Josh (2009-04-09). "Foursquare co-creator on privacy, Easter eggs". News.cnet.com. Retrieved 2011-04-21. ^ Indvik, Lauren. "Earn Badges on Foursquare, No Checkins required". Retrieved 23 September 2010. ^ "Everything you need to know about the new foursquare points and leaderboard". Aboutfoursquare.com. 2011-03-09. Archived from the original on 2013-01-28. Retrieved 2013-02-01. ^ Welch, Chris (22 June 2015). "Foursquare finally brings mayorships and true competition to Swarm". The Verge. Retrieved 18 December 2018. ^ "Foursquare starts charging merchants for instant verification". Venture Beat. Venture Beat. Retrieved 20 July 2016. ^ Microsoft (2013-08-29). "Foursquare app for Windows in the Windows Store". Microsoft.com. Retrieved 2013-08-31. ^ foursquare. "Foursquare Twitter Page". Twitter.com. Retrieved 2010-03-12. ^ "Get Foursquare - Microsoft Store". Microsoft Store. ^ Jennifer Van Grove (2009-11-19). "Foursquare Goes Global With Launch in 50 New Cities". Mashable.com. Retrieved 2010-03-12. ^ "foursquare. Everywhere". Foursquare.tumblr.com. 2010-01-08. Archived from the original on 2010-10-05. Retrieved 2010-03-12. ^ MG Siegler (September 20, 2010). "Foursquare 2.0 Goes Beyond The Check-In — By Reshuffling Old Features". TechCrunch.com. TechCrunch. Retrieved September 20, 2010. ^ Leena Rao Feb 21, 2011 (2011-02-21). "Foursquare Closing In On 7 Million Users". Techcrunch.com. Retrieved 2011-04-21. ^ "President Obama Joins Foursquare". mashable. 2011. Retrieved 2011-08-15. ^ "The #allnew4sq is here. Download it now!". Archived from the original on 9 June 2012. Retrieved 7 June 2012. ^ Scott, Cameron. "Glancee CEO explains social discovery apps at SXSW". Retrieved 10 March 2012. ^ NICK SUMMERS, The Next Web. "Back to basics: Swarm redefines the Foursquare check-in to help you meet nearby friends." May 15, 2014. Retrieved Jan 12, 2017. ^ foursquare. "Foursquare Twitter Page". Twitter.com. Retrieved 2010-03-26. ^ foursquare. "Foursquare Day Page". Facebook.com. Retrieved 2010-03-26. ^ Charles McMahon (2011-04-14). "What is Foursquare Day? Find out in Portsmouth on Saturday". SeacoastOnline.com. Retrieved 2011-04-21. ^ "Check in and check it out: Foursquare Day Toronto, 2011 | Posted Toronto | National Post". News.nationalpost.com. 2011-04-13. Retrieved 2011-04-21. ^ Van Grove, Jennifer. "McDonald's Foursquare Day Campaign Brought in 33% More Foot Traffic". Retrieved 17 September 2010. ^ a b c McCarthy, Caroline (2010-02-17). "The dark side of geo: PleaseRobMe.com". CNET.com. Retrieved 2010-10-12. ^ Leggio, Jennifer (2010-03-25). "Foursquare's privacy loopholes". ZDNet US Edition. Retrieved 2011-04-26. ^ a b c d e Singal, Ryan (2010-06-16). "White Hat Uses Foursquare Privacy Hole to Capture 875K Check-Ins". Wired News. Retrieved 2010-10-12. ^ a b Dugdale, Addy (2010-07-01). "Foursquare Checks in to Almighty Security Row, Loyalty to Users Questioned". Fast Company. Retrieved 2010-10-12. ^ Kang, Cecilia (2011-04-08). "foursquare founder Selvadurai talks about privacy, future". The Washington Post. Retrieved 2011-04-12. ^ Patil, Akshay. "Changes coming to foursquare's "here now" feature". groups.google.com. Retrieved 18 May 2012. ^ Thompson, Chris. "Foursquare alters API to eliminate apps like Girls Around Me". Archived from the original on 13 May 2012. Retrieved 18 May 2012.